First time seeing the potty and reading the potty book. I'm planning to do everything in my power to get my son to skip the potty and go straight to using the toilet with just a "toilet trainer" seat. If I'm successful, I will need only a "toilet trainer" seat that goes on the toilet and a stepstool to help him reach the toilet, and I won't need a potty. But I also recognize that I should be prepared in case things don't go as planned. That is why I was happy to learn that Ubbi (one of my favorite baby brands) came out with a 3-in-1 Potty, Toilet Trainer and Step Stool that can be used as a potty or atop the toilet. It is really well designed -- it's sleek, compact and multi-functional. In this review I will share (1) colors options and pricing, (2) an overview of the pieces, and (3) details about the individual pieces, their functions and my experience with them so far. Ubbi's 3-in-1 Potty, Toilet Trainer and Step Stool comes in white with four accents color choices -- grey, navy, pink, and orange. All four colors are available at Amazon. The list price is $39.99, though certain colors are discounted at Amazon as of the time I'm writing this. I chose the grey but if you like navy or pink, those colors are currently 50% off at Buy Buy Baby. To be notified of other deals like this, join my Facebook group. Click here to buy at Amazon and here to buy at Buy Buy Baby. The product includes four pieces: (1) an adjustable toilet trainer seat with built-in handles, (2) a step stool that can also be flipped over to serve as a potty base, (3) a hook to hang the seat from the side of your toilet, and (4) a removable inner bowl for when using as a potty. You can also buy each item (besides the removable inner bowl) separately (click here for individual pieces at Amazon and here for individual pieces at Buy Buy Baby). All pieces are PVC, PBA, and Phthalate free. 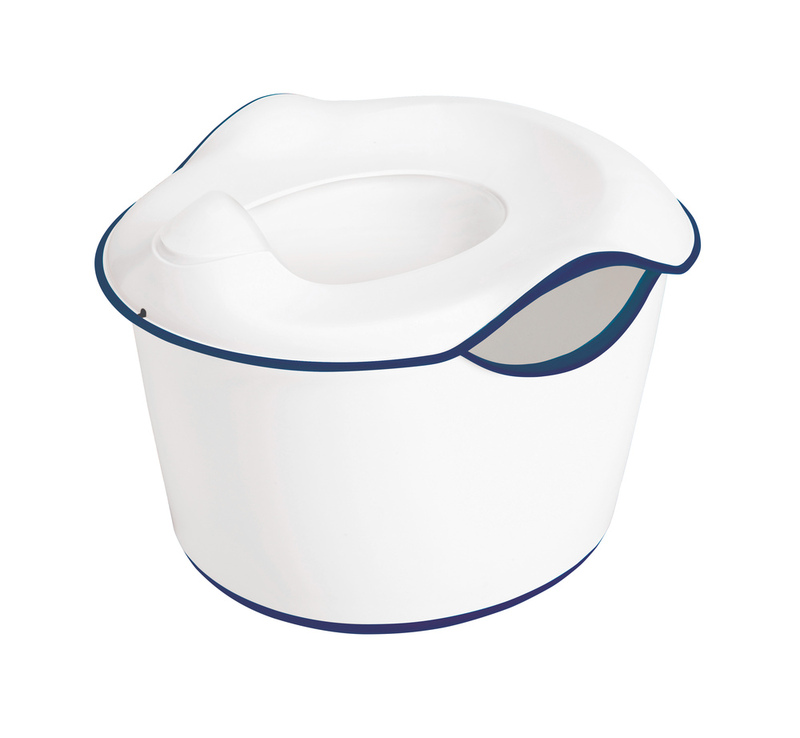 The seat can be used alone atop the toilet as a "toilet trainer" or you can click it into the base and use it as a traditional potty. The integrated handles are designed to give your child a sense of stability. 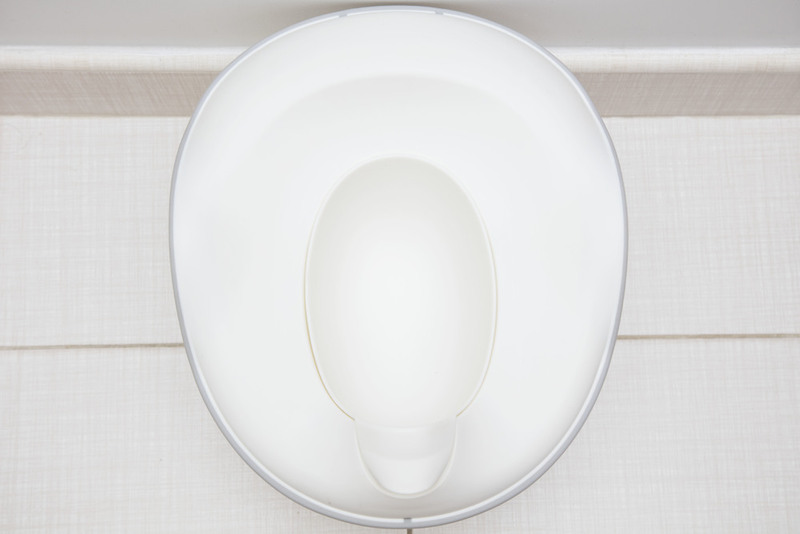 If you plan to use it atop your toilet as a trainer, there are a few neat features that you should know about. First, the seat can be adjusted to fit most non-padded toilet seats. See image below for how to adjust. This was essential for me as as I have the more modern elongated toilets and many trainer seats don't fit. Those notches on the back side allow you to adjust the seat to fit your toilet. Second, it comes with a hook (see below) to hang it from the side of your toilet. Third, it has a splashguard to prevent errant pee. I'll be honest and say that I haven't used this piece yet other than to have my son sit on it in his diaper for about a minute both as a potty and atop the toilet. He is a big 19 month old and he was very comfortable and happy. My son is not ready for toilet training, so at this point we are just using the step stool for hand washing and it is working out great. We also use this faucet extender, which happens to coordinate perfectly with the grey stool. The stool is compact and lightweight, yet surprisingly stable. It has non-slip rubber detailing to keep it in place and to keep the child from slipping while standing on it. I often sit on it while bathing my son (it has a weight capacity of 200 lbs). I love that the brand included a hook to hang the seat from the side of your toilet and keep it out of the way. I've had the seat hanging from the side of my toilet for a full month. I've had a lot of company and no one has commented about it. I don't think that my friends and family are too polite to inquire, it's just that the design and the way it hangs are so sleek that they didn't even notice it. 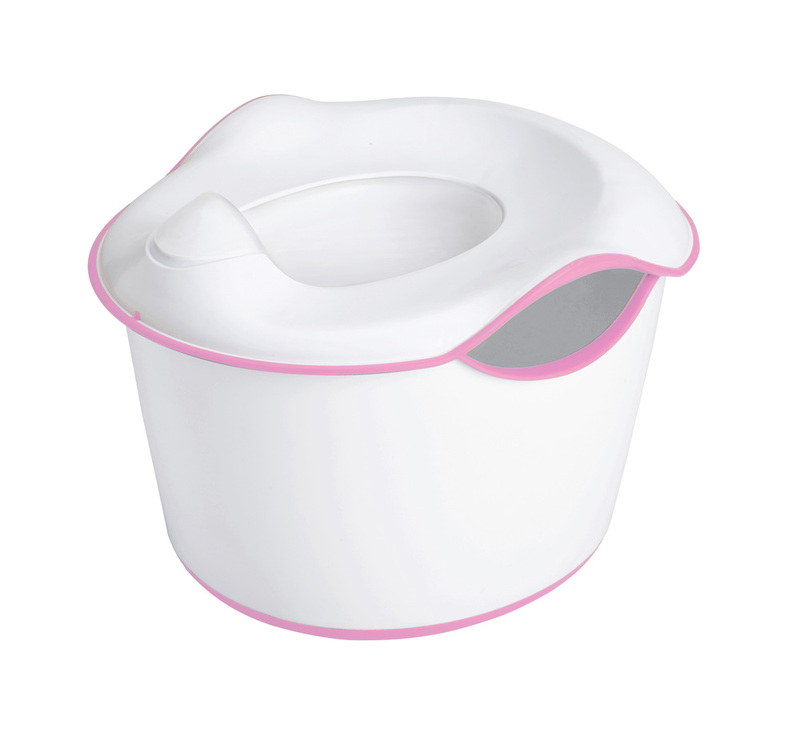 When using it as a potty, the removable inner bowl is inserted over the seat. One of my friends recommends putting a bit of water in be bowl before your kid goes #2 to make it easier to wash out. If you can't get past the idea of washing out the inner bowl after each use, you could use disposable potty liners. I poked around Amazon reviews of the potty and one reviewer said that she stores the liners in the potty under the seat, smart! JThe inner bowl also has a splashguard. There are many theories on what age to introduce a potty to a child. A few of my friends bought potties when their kids turned one so that they would become "familiar" with it. That didn't resonate with me. I got mine when my son turned 1.5, and only because I thought he would appreciate standing at the sink to wash his hands with only minimal assistance. I put him on the potty for just a minute to get photos for this post but probably won't again for months. The nice thing about this product is that it is so compact that you can buy it now to use only the stool and put the rest away until your child seems ready. Even though we aren't toilet training yet, I got my son this book as well as some others to get him used to the idea. Click here for a great list of potty books. As soon as I heard about Ubbi's 3-in-1 Potty, Toilet Trainer and Step Stool, I knew I had to have it for my son. I already know and trust the brand (we don't leave the house without the Tweat snack container) and was instantly impressed by the multi-functionality and that it can fit on most any toilet. The brand has won awards for the clever and innovative design. I've recommended it to my best friends and recommend it to you. Click here to buy the potty at Amazon and here to buy at Buy Buy Baby. When did you start potty training your kids and what were the signs that they were ready? This post was sponsored by Ubbi, all opinions are my own.